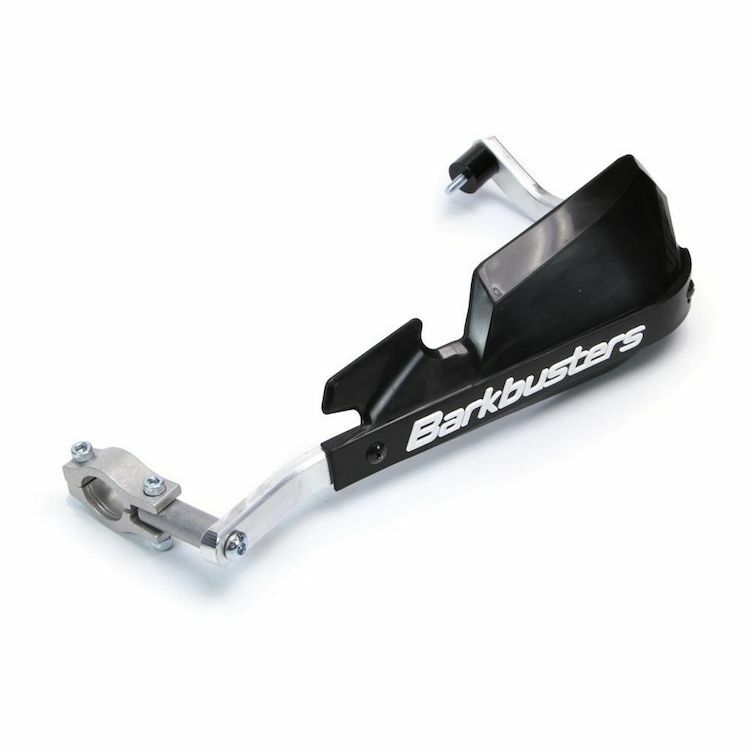 Barkbusters Variable Protection System Handguards feature a set of primary wind and brush deflectors as well as a secondary set that can be removed entirely for summer use or extended fully for the colder months. These high-impact plastic deflectors sit on top of an Aluminum Handguard Kit. This aluminum kit bolts to the end of your bars and then onto a second mount that clamps directly onto your bars, inward, in front of your controls. This two-point approach forms a cage around your hands and also protects your handlebar controls to prevent or minimize damage in a crash scenario. Bike-specific hardware is designed to clear throttle cables, hydraulic lines and other interferences found within individual bike models. I purchased these for my 2016 Triumph Tiger XCA after an off road spill broke my lever because the OEM guards didn’t provide any strength or protection. The Barkbusters are a much needed upgrade. Although a bit finicky to install, it was worth the few WTF’s when they were installed. I haven’t tested them yet but I have a lot of faith they won’t fail. Great product and STELLAR customer service! As everyone else as said, this is a solid, sturdy product. My main point of this review was to give a shoutout to Nick G at Revzilla customer service. Being a mechanical idiot, I was having some issues. Thought the wrong size clamps were in the kit cause I was trying to install them down on the horizontal thicker part of the handlebars. What started with a phone call on a Sunday turned into several back and forth emails, with pics attached. At every step he was nice and encouraging and totally professional. He even followed up the next day, unprompted, with further suggestions. Nick and Revzilla rock, and the Barkbusters are looking good on my 2016 Tiger! Durable handguards, don't like the way aluminum finish looks, all metal parts would look a lot better with a black powder coat finish. Installed them last week. Was a bit confused when I first opened up the package and saw the extra parts. But in short order it all became clear. This is a wonderful setup. You actually get 4 possible levels of wind protection. 1. No protector just the bar. 2. Just the basic wind protector mounted on the bar. 3. The basic wind protector and the extra protector in the lower mounting holes. 4. For max protection, the extra protectors get mounted in the upper mounting holes. No problems with mount, instructions are very clear. Because the factory Tiger "hand guards" are kinda wimpy. Reputation of being a good product, although I feel like they are way over priced. 2nd set, the first ones survived a 30mph impact. Are the barkbusters logos removable? Will this fit a 2016 Tiger 800 Xca? I would like the storm handguard kit for my 2014 tiger 800 abs. This is the only kit that lists as model specific. Which storm kit fits the tiger and will it work the the kaoko throttle lock made to work with the vps handguard kit? I have installed the Barkbusters VPS Handguard Kit on my 2015 Tiger 800XCx, and they fit very well. The 2015 Tiger has cruise control already built in, so I can not specifically answer your question about the fit with the the kaoko throttle lock. One of my riding partners has the same handguard kit on his 2013 Tiger 800XC with a throttle lock (Sorry, I do not know which type. ), and they are compatible.